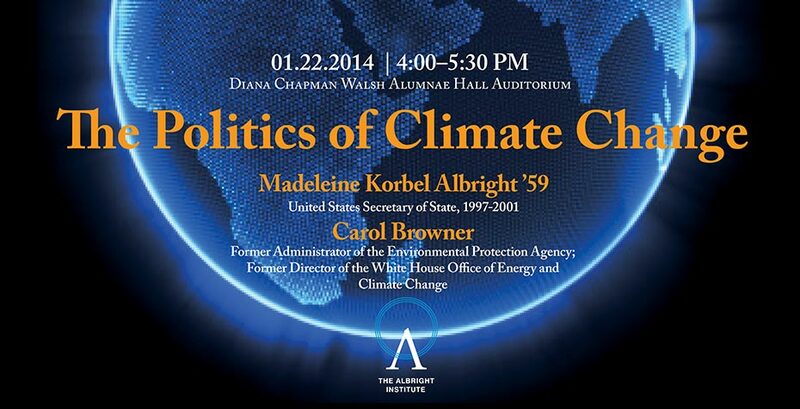 Wellesley hosts a dialogue with Madeleine Korbel Albright ’59, former United States Secretary of State, and Carol Browner, former administrator of the Environmental Protection Agency and former director of the White House Office of Energy and Climate Change. Peter Thomson, Public Radio International's environmental editor and former editor of NPR’s Living on Earth, will serve as moderator. Join us for a lively discussion as we explore the challenges and opportunities of climate change and environmental policy. The talk is free and open to the public, and takes place in Diana Chapman Walsh Alumnae Hall Auditorium today, January 22, at 4 p.m. Alternatively, you may watch the event streamed live online. Albright and Browner, who worked together under the Clinton Administration, are visiting campus for the 2014 Madeleine Korbel Albright Institute for Global Affairs Wintersession program. Browner is the Institute’s 2014 Distinguished Visiting Professor. Albright established the Madeleine Korbel Albright Institute for Global Affairs in 2010. The Albright Institute brings a unique interdisciplinary approach to the challenges we face in the world today. Each year, 40 Wellesley students are chosen as Albright Fellows and begin a transformative process that takes them from the classroom to internship placements at leading organizations around the world. During Wintersession, the Albright Fellows attend classes with a series of prominent speakers, including Wellesley faculty, alumnae practitioners, and thought leaders from outside organizations. The Fellows work together in interdisciplinary groups on a variety of pressing international issues, and present their findings to the Distinguished Visiting Professor. Learn more about this year’s Wintersession program and watch videos featuring speakers on the Albright Institute Website.